1. In a large bowl, sift baking soda, cornstarch and Epsom salts. Stir in the citric acid until all is well mixed. In a bit of water dissolve your food colouring. Use a mister to spray the food colouring (and essential oils, if using) and water into the bowl. Try to avoid letting it fizz – that means too much water in one place. Stir as your spritz. Mix until the dough starts to come together when pressed. 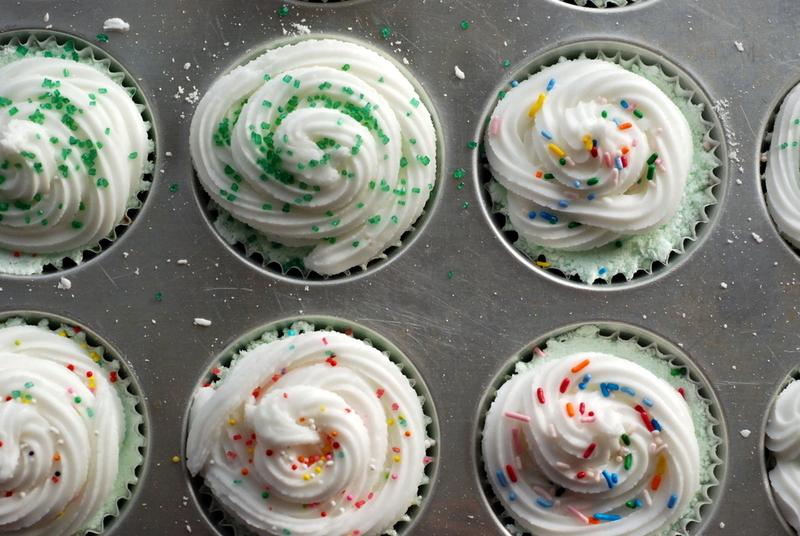 Press into muffin tins, preferably lined with wrappers in case they become crumbly. Pack it all in really tight. You don’t need a flat top. Something curved will allow the frosting to stay attached. Allow to dry for a few hours. 2. When ready, make your icing. 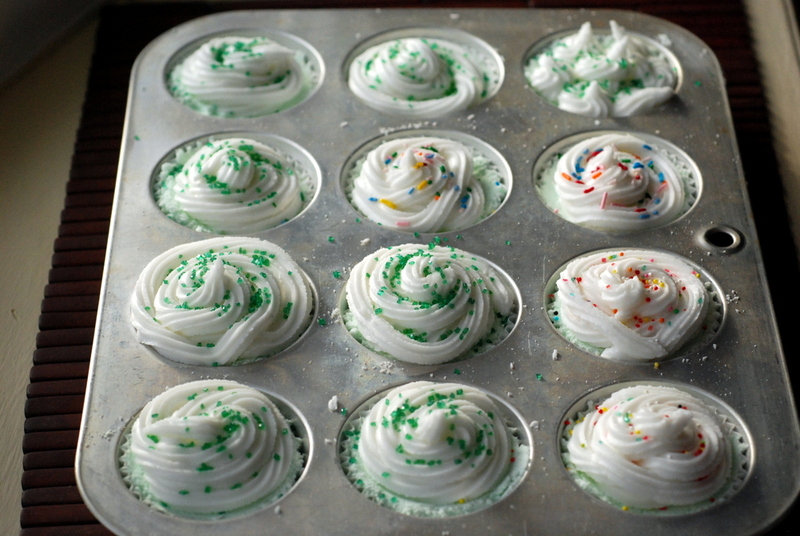 In a small cup, combine meringue powder and water. In a large mixing bowl, place sugar and cream of tartar. Slowly add in the wet mixture and beat with a mixer for 5-10 minutes on medium speed, until it is fluffy and stir peaks form. If it is too stiff, add in more water. 3. 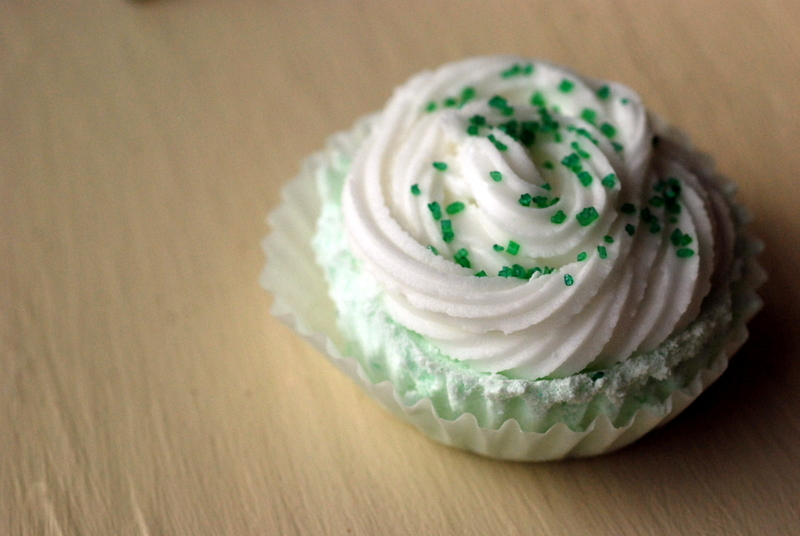 Use a frosting pipe and tip (or use a plastic bag with an edge cut-out) and frosting your cupcakes. Start at the middle and work your way outwards, then back up in the middle again. Dust with sprinkles. Allow to dry for a few hours, preferably overnight to a few days. 4. To use: plop into a bathtub filled with water. Remove wrapper prior to adding to bath. Watch it fizz! What fun! I’ve never made anything like this before, but it looks just like it would be both fun to make and to eat! Thanks for sharing. They do look pretty enough to eat……..but don’t try too. Way too cool Janet and so pretty! How fun and pretty–what a great gift these would be. Great job! They looks so super cute! I`ve never seen anything like these, what a fantastic idea! You could open up a stand at a craft sale and sell these, I bet they`d be super popular! 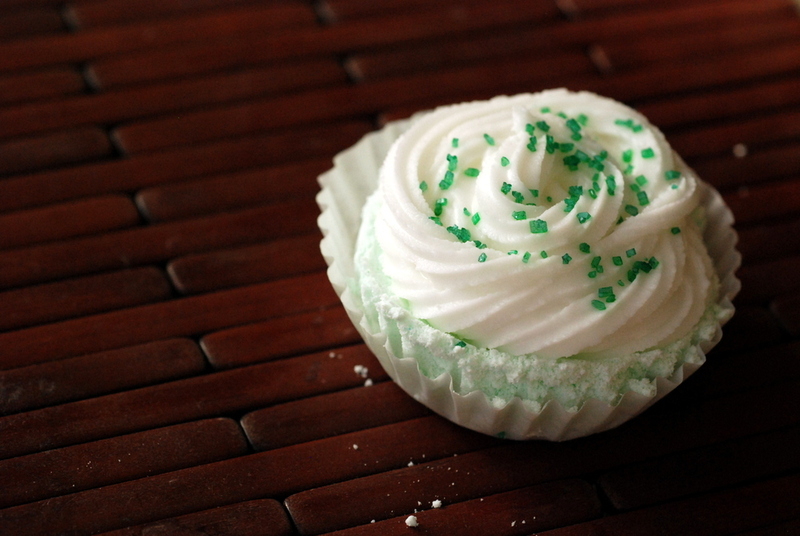 You have two options, you can make “Royal Icing,” or you can purchase ready made frosting from the grocery store such as Cake Mate decorating icing for cakes. 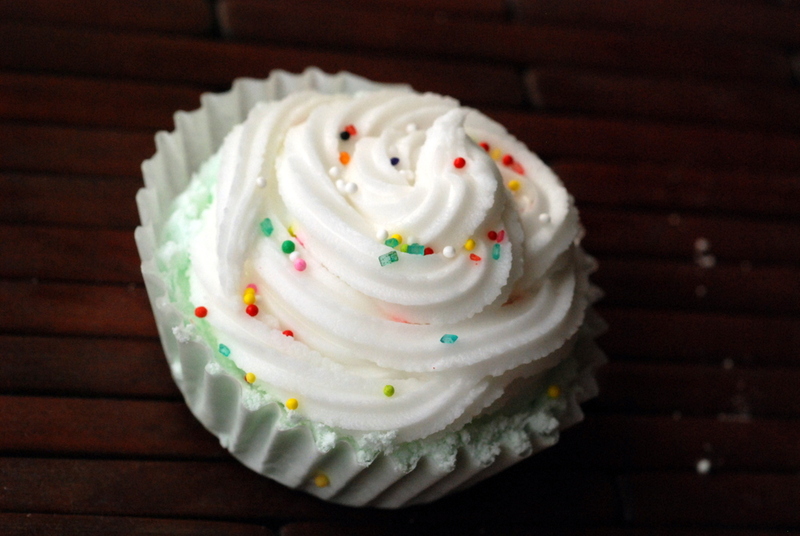 If you purchase ready made frosting from the store, make certain that it will dry hard. Gel frostings don’t dry hard and bleed.